For the past several weeks I have been diligently searching for information about the Homeless Prevention and Rapid Re-Housing Program that is intended to help those struggling to stay in their homes because of the current economic recession. Although I was able to find many articles online that reported success stories of households being helped by this program, there were many more families who have fallen through the cracks and end up homeless and left with making a choice to seek help from local shelters or living in their cars. I decided that I needed to get to truth about this problem. Are there simply a lot of whiners who are complaining because they don’t have the desire or motivation to better themselves or their families? Or is there really something wrong with this program that has not come to the attention of the media? Unfortunately, many hard working people who have applied for this program assistance are being denied help because they have no sustainable income at the time that they apply for assistance; which is not listed on the HUD site as a determining factor to receive assistance. One example is a married couple with 6 children who have been struggling for some time now to get assistance. They both lost their jobs several months ago and the husband is waiting for acceptance for disability while the wife is attending Bellevue University to better herself and her family. They live in a house that has a bad mold problem and is the cause of the children often getting sick. There is also dangerous lead paint in the home but they can’t afford to live anywhere else. They have received an eviction notice and are about to have their utilities shut off. They were denied HPRP assistance because they have no sustainable income. Many families end up homeless because of the denial by sub-grantees that were set up to prevent homelessness. If people are not actually being prevented from becoming homeless what is the grant money being used for? I have contacted several agencies and political leaders about this but have not received any response. It has also been difficult for me to find any information on how many people have been helped in Nebraska by the HPRP program. Thank you for looking into this. After several weeks I did receive the chart below in an email response from one of the agencies in Omaha. As you can see by the chart, there is no specific information, such as the reason why some of the households were denied assistance. Only that they were denied assistance. 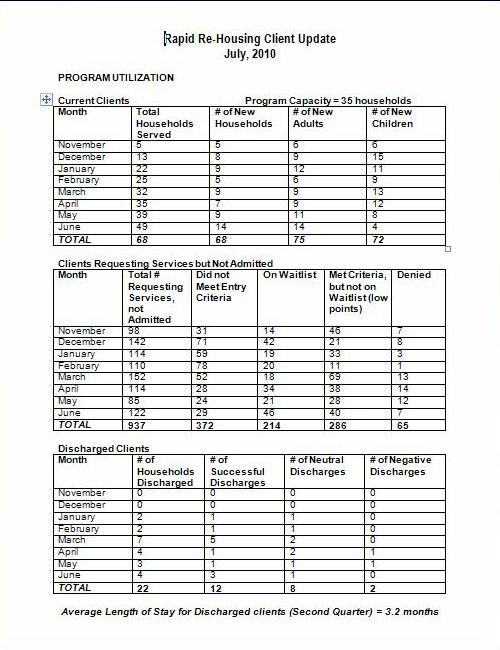 It also appears that out of 937 households 372 did not meet criteria, 214 are on a waiting list, 286 met the criteria but are not on a waiting list because of low points, (whatever that means) and 65 households were denied assistance. Out of those 937 households only 68 were served. Even the agency that sent me the email said they did not fully understand the chart. Re-Housing Program. I always appreciate hearing from my constituents and I am disheartened to hear of your concerns regarding this program. As you know, while federal funds do support the Homelessness Prevention and Rapid Re-Housing Program, the State of Nebraska is actually charged with implementing the program. Therefore, I, as your United States Senator, do not have the ability to influence eligibility. I encourage you to contact your State Senator Brad Ashford, and Governor Dave Heineman to share your concerns with them. For your convenience I, have included Senator Ashford’s and Governor Heineman’s contact information below. I trust that you will find this information helpful. Thank you for providing me with the opportunity to assist you in this matter. This automatically generated message acknowledges receipt of your e-mail to the Department of Housing and Urban Development (HUD) Office of Inspector General (OIG). We will assign your correspondence to one of our analysts for review in the order of receipt. Please note, we receive many more complaints than we can address immediately within OIG resources, and we receive complaints that fall outside OIG jurisdiction. Therefore, we limit investigative effort to those issues that represent the most serious potential risk to the HUD programs and operations or for which the OIG may be the only avenue of redress. It is unnecessary to resend your e-mail message or to call or e-mail us again to ask for a status report; as we can’t provide you with case status updates or other information while a review is in progress. We will not respond further if your issues are not a matter for OIG review. You will hear from us within 60 days ONLY if your issue falls within OIG jurisdiction. Please do not respond to this automatically generated message. Thank you for contacting the Hotline with your concerns. It is very disheartening to me that so many families are being put at risk because of possible bureaucratic red tape. Hopefully, I will have more substantial answers in the near future. As I continue this series I would welcome any comments or feedback on this subject. Interesting story. I contacted Catholic Charities regarding the HPRP Program in Contra Costa County – California. I was told that there was NO such program. Are you kidding me??? People are not stupid, the information is posted all over the internet, I can’t help but wonder what’s really going on; what are these agencies really doing with the money. We (struggling families) would have been better off receiving a lump sum from the stimulus package and finding our own housing and pre-paying our rent up-front 6-12 months. California is one of the most difficult states to find housing, especially if you have credit issues due to situations beyond your control. I wrote a blog titled “Are You In Need Of Housing”…other states such as Georgia, Texas and Illinois are helping families to get off of the streets. Property managers are offering No credit check & 2nd chance rental…2nd chance rental is for people that have evictions, felonies, bankruptcies, bad credit, basically all of the things that can deny you for an apartment. There is only one city in California that offer 2nd chance leasing – Sacramento, CA. In my opinion, this offer families a glimmer of hope. Texas, Georgia, Illinois are states that are affordable in comparison to California. You can find a 1-bedroom for $500/month or less. A 1-bedroom is a small space for a family of 4 or 5, but I’d rather live in a tiny 1-bedroom than to sleep in my car. “Do What You Gotta Do, To Get To Where You Need To Be”…I believe things are going to turn around, but in the meantime…sacrifice, move out of state if you have too, rent a room in a large home, Winter is approaching kids need warmth, shelter and the feeling of stability. My GOD, I pray this situation turn around for ALL of us! Try calling your State Senator not your United States Senator – his or her constituent’s services person should be able direct you to the appropriate state office. My son and I are in this program in Washington State but sadly the funding runs out after so long. We moved here in an emergency to seek medical help for my son and I was told there were a lot of jobs here. I think most of the country thought the same thing and moved here as well-let me say if you are looking for jobs you should pray again about Washington before you move here, HUGE budget cuts throughout the states. Programs being cut everywhere. Government jobs are being cut. It all took a few years to trickle down to WA state but it has finally hit. Things aren’t good here. The great thing is that my son is healed now and that is a huge blessing! So, I cannot complain about HPRP for helping us to not be homeless. That’s a scary place to be. However, I have not been able to find a job here. That shouldn’t be a problem for me and I believe that’s what the Rapid Rehousing program I am in thought as well. I have a B.A. and an extensive and impressive background. However, the well is running dry and we need to move back to where some family and friends are before we are homeless again. So, HPRP IS limited on funding per family at least here. As far as Catholic Services, they are the one who put us in the program. But, Catholic Services is understaffed in every state right now and not every social worker there is aware of Rapid Rehousing but many do know it as HPRP (and perhaps visa versa in Costa County?). The sad thing about this is, will we qualify for Rapid Rehousing if we have to when we move out of state? I don’t want my son in a shelter. Bed bugs are a problem all over and so is crime. And renting a room is not easy when the funds aren’t there. In any case, I wanted to say that in Washington State, the program IS working but the funds are limited. And, I still had to pay a monthly amount in rent. So, here we go again. LOL! But I have total faith that God WILL provide. I want to add though that you have to be referred by a social worker here to be able to apply for this. Or at least that’s what happened with us. Try your local YWCA, YMCA, Catholic Comm. Services or call 211 and ask for organizations that help with housing. I had to be in with Cath. Comm. Serv. for a while before my caseworker said, I think you would be perfect for this program. I don’t think you can just call and request it. Catholic Services does NOT utilize Rapid Rehousing here, they sent us to another housing program that also included HPRP as an option. I wanted to add this. So merely calling CCS may not work because they don’t offer it here either. I am so sorry for your struggles and pray that somehow things work out for you. I have contacted several political leaders (local as well as those in DC) about HPRP with no helpful responses. I even contacted several people at HUD with no success. The problem is not with HUD, but with the local grantees. HUD allows them to put more stringent policies in place and that is where the denial of assistance comes from. HUD’s HPRP is a great program that has worked out well in many major cities like New York and Chicago. If local grantees would simply follow HUD’s Eligibility Guidelines many more people would get the help they need. Let me know how things work out for you. I live in Boston Massachusettes the most expensive city in the country to live in and am a single mother of one. After losing my job as administrative assitant in 2010 I found it very hard to procure work in my chosen field of almost fifteen years without a degree. I applied for jobs as customer service and was literally told i was overqualified and should look for work in the private sector. Yes Boston is also a very class conciouse city to boot. I am now attending classes full time in order to get a degree and start my own business. I work at the college as a tutor for a little more than minimum wage and am STILL looking for fulltime work. The apartment that my child andIi live in is no longer safe. The family that rented us thier third floor apartment seemed very nice when i gave them my security deposit, and the neighborhood is on a “good” side of town. Unfortunately the family is not whatthey apered to be and after two years of police raids and a fowl dealings with the family (they are keeping my security deposit due to damages. The damage they speak of was here when i moved in) i am ready to move out and get into a safe place for me and my daughter. I have the means to pay rent but not the means to pay what will be a 1200 dollar security deposit fee up front. That’s not including last months rent. another 1200 dollar fee up front. So i researched help online and came across info on the HPRP program. It was heartening to see that security deposits were something HPRP funds could be applied to. I have just spent the past two hours calling the agencies listed as being charged with meting out the funding. Some have said they have no idea what HPRP is, others have said they have no more money to give and one agency denied ever having been given such funding. The Department of Transitional Assistance has a local office that is listed on the HPRP resource list. After being hung up on and purposely misdirected three times i finaly reached the person in charge of taking cases for homeless assistance. According to him he works for DHC (yet another acronym) and they have nothing to do with the HPRP. Unless I am homeless right this minute , he said, he can’t do anything for me. It was my understanding that PREVENTION was one of the “P”‘s in HPRP. In order to get out of this helish living situation I have to go into a homeless shelter before I can get any help from the state agencies who are listed as HPRP fund recipients but “have nothing to do with HPRP”. Well they won’t have to wait too long. The last jack booted cop to leave via fire escape told me the family is only one more drug bust, or shooting, or domestic violence call away from having thier property seized. On that day my daughter and i will definately be homeless. So I am asking where did the HPRP funding go? Who has it? Why isn’t somethign being done about the apparent mismanagement of Federal dollars at the state level? If this had happened with the money meant to bail out the Industries it would make national headlines. Why isn’t anyone talking about this in the media? God bless you, Sister! I have been there and done that. With Rapid Rehousing you must be homeless at the time which can also include a hotel as well. You must be within the city limits to qualify. Our program saved our lives. We were one step from a shelter. They paid for a hotel (uncertain if the funding is there for every program) until we could get the application filled out and approved for Rapid Rehousing. This was a 24 hour turnaround and within a week we were in an apartment. Call them ASAP! Hi my name Trinity I am a mother with three children two of whom have autism. I live in Indiana and have had a run in with the HPRP. My daughter receives SSI and I receive tanf and Food stamps. My gross is about 904. Iwas told at first I would be a pproved for the program when I went in for my first interview. Than the woman at catholic charities told me I might not be approved because I was filing for my SSI because I have a pacemaker and heart condition. I might qualify or need a long term program. When I proceeded to ask about section 8 and explained that list would be closed for two years atleast she told me there was nothing she could do because they don’t believe I have a chance of advancing myself. Catholic Charities Diocese of Gary received federal money who are we helping people who already have a place n jobs hello whats going on? Hi Trinity. I am sorry you are struggling. However, you are already receiving a significant amount of money from the tax payers. We cannot afford to continue paying you and everyone else all this money. At some point, you need to stop demanding help from the government, pull yourself up with your boot straps, and take care of your own needs. No one owes you. She has a pacemaker and heart condition, Kris. Have YOU ever tried to get a regular job with a disability??? You are considered a liability most places. It was easy for ME to pull myself up with my bootstraps because I am a healthy woman. Go read about Jesus, Ghandi and others like them, they reached out to the poor and needy. Maybe you need to go work in the drudges of the inner city and see what it is like to live with a disability and have a child. Maybe it’s time for you to have some heart surgery yourself. I’m praying for you. Indiana is a tough place to be right now. Mitch Daniels has gotten rid of so many programs that are still badly needed. Please see if you can get help from some of the charities in both South Bend and Chicago. Don’t give up. The HPRP Program in Riverside, CA is an absolute joke! My 25 year old sister is now homeless with her 5 week old daughter and they say they are UNABLE to help her because she is still of work on pregnancy leave and only receiving CA Disability so that doesn`t show she can pay rent anywhere!?? My husband and I both work and applied or HPRP to help pay ONE MONTH`s rent while he was laid off and they couldn`t help us or our two small children because ALTHOUGH WE QUALIFIED OR EVERYTHING they said our landlord was charging TWENTY FIVE DOLLARS MORE THAN THE AVERAGE TWO BEDROOM & TWO BATHROOM APARTMENT WAS RENTING FOR IN CORONA, CA!!! President Obama – step in and make this something that can and MUST help real people in need! The problem is not with HUD or federal guidelines but with the local grantees. HUD allows local grantees to put more stringent policies in place and that is where the denial of assistance comes from. HUD’s HPRP is a great program that has worked out well in many major cities like New York and Chicago. If local grantees would simply follow HUD’s Eligibility Guidelines many more people would get the help they need. I would suggest trying to contact your local HUD officials and/or government representatives. I pray that you and your family find the help you need.